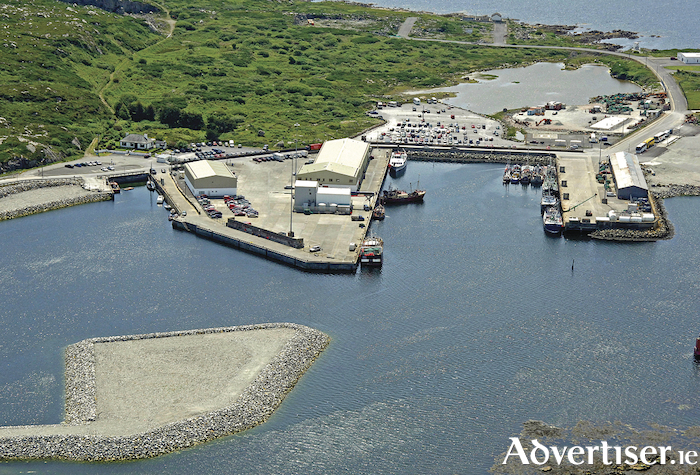 The value of landings at Ros a Mhíl, County Galway’s leading fishing port, amounted to €12 million in 2017 and totalled a weight of 2,700 tonnes, according to the annual Business of Seafood report, published by Bord Iascaigh Mhara (BIM ) this week. The findings show the industry is a significant employer in the region’s coastal areas with over 1,760 people in coastal communities in Galway and Clare dependent on seafood for employment. The aquaculture sector, which comprises chiefly of salmon and oyster farming in the region, was worth a total of €44 million in the Western region last year and enjoyed 24 per cent growth nationally. Seafood processing also experienced significant growth last year and there are now almost 4,000 people employed in seafood processing companies across Ireland. 23 of these companies are located in the Galway and Clare. The Business of Seafood 2017 report was published by Bord Iascaigh Mhara (BIM ), Ireland’s Seafood Development Agency and launched this week by Minister for Agriculture Food and the Marine, Michael Creed T.D. Jim O’Toole, CEO of BIM said that Ireland’s Seafood Industry is thriving, with Ros a Mhíl representing a vital part of this success. “Over the last two years, the contribution of the sector to Ireland’s GDP has grown by over 14 per cent. The fact trade sales have exceeded €1 billion for the first time demonstrates the clear demand for Irish seafood and it is important we build on this impressive performance as we collectively work to achieve the targets for seafood in the Government’s Food Wise 2025 report,” he said. Ireland’s seafood sector recorded its third consecutive year of growth in 2017, with its value up 6.4 per cent on the previous year, to contribute €1.15 billion to Ireland’s GDP. This strong growth was driven by a 12 per cent increase in net exports (€331m ), a 4 per cent increase in domestic consumption (€429m ) and significant ongoing investment both private and public (€386m ). In terms of trade, the EU remains Ireland’s main export market valued at €392 million (up 9 per cent ). The report also demonstrates that Irish seafood is building significant growth markets across Africa, Asia and the Middle East all demonstrating double-digit growth. On the domestic market, Irish appetites for seafood continued to grow with a four per cent increase in seafood consumed in Ireland, now valued at €429 million. Domestic consumption comprises of sales in supermarkets and shops as well as in restaurants, cafes and canteens. Salmon, cod and prawns continue to be in favour with Irish consumers with salmon valued at €96 million and cod at €48 million. Growing demand from species such as pollack and hake are contributing new growth up 19 per cent in 2017. Around the coast, over 14,000 people are employed, directly and indirectly, in the seafood sector and this value should not be underestimated as Mr O’Toole added: ‘As well as employment, seafood is a key driver in economic activity and, in many cases, is at the heart of the community. In the West, the sector accounts for seven per cent of total coastal employment. Seafood processing companies are growing in number and now account for almost half of the total employment in the Irish seafood sector. The revenue and employment seafood delivers to our overall economy and directly to our peripheral coastal communities is invaluable’.